Lately I bought an airbrush and mini air compressor (suitable for modelling purposes small 4 BAR unit). 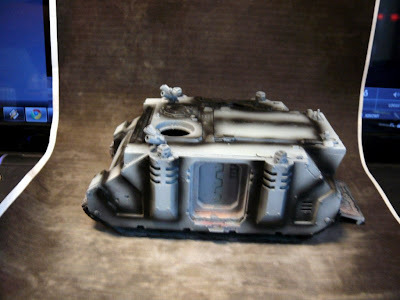 I figured it would make it easier to paint some of 40k models plus I'll save on spray basecoats. Yesterday I finally had time to set it up and let the fun begin. First on the agenda is Land Raider and Rhino (the same I did earlier, client didn't like it so I had to strip it from paint). 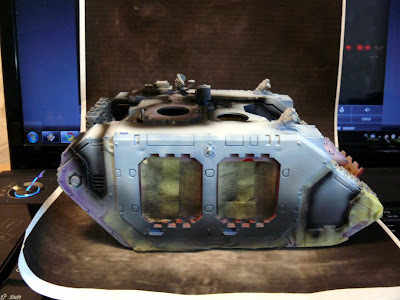 So so far I just secured with paper tape and Humbrol Maskol, areas that would be white (in case of LR) and performed preshading using white and black paint (visible on both LR and Rhino). Now it's time to make the metallics kick in ;) We'll see if I managed to complete it within several days.